This edition of Who Pooped in the Park? follows Michael and Emily on a trip through the Colorado Plateau: that huge high-altitude area covering portions of Colorado, Utah, New Mexico, and Arizona. 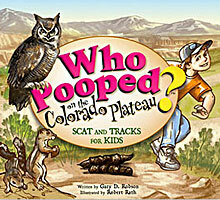 This book will expose children to the wildlife of the area, and to the amazing scenery of the area.